This page covers the author of The Elegant Universe: Superstrings, Hidden Dimensions, and the Quest for the Ultimate Theory. For other authors named Brian Greene, see the disambiguation page. Brian Greene has 1 media appearance. Saturday, September 14, 4:00 p.m. The bestselling author of The Elegant Universe and The Fabric of the Cosmos tackles perhaps the most mind-bending question in modern physics and cosmology: Is our universe the only universe? BRIAN GREENE reads from Icarus at the Edge of Time. Brian Greene , Icarus at the Edge of Time. "Brian Greene" is composed of at least 2 distinct authors, divided by their works. You can edit the division. Go to the disambiguation page to edit author name combination and separation. 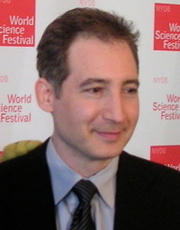 Brian Greene is composed of 8 names. You can examine and separate out names.